HEADS-UP! I’ve completed updating the links to my freebie icons and clip-art on six (6) more of my older posts. As previously mentioned (here) and (here), these updates may have some icons or clip-art that was not in the original post, so you might want to check them out. See below for a list of the latest updated posts with links to them. Who’s yer Avatar see in the mirror? And for this very early morning day’s serving of freebie original images, I offer you Part 1 of my quirky, quickie new series entitled “Pink Jelly”. Enjoy! Class up the joint with this 4×6″ Flexible Refrigerator Magnet featuring YOUR uploaded photograph (or the grandkids, the hottie from next door, or…?) with IconDoIt’s wonderful new frame design (A delightful tromp l’oeil of a richly carved cherry wood window frame, gracefully draped swag curtain panel, all against one of William Morris’ intricate Arts & Crafts movement wallpapers. Upload your own photo and personalize the inscription for a simply elegant, thoughtful, affordable gift that’ll be cherished for years to come. Your photo will be surrounded by IconDoIt’s original artwork inspired by an ornate, Edwardian-era (Art Nouveau) brass picture frame inherited from her Grandmother, Sara. What Fun! 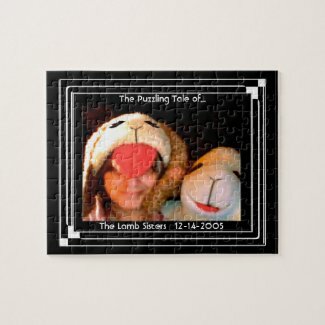 A 110-piece jigsaw puzzle featuring YOUR uploaded photograph (to replace IconDoIt’s with her favorite lamb), surrounded by IconDoIt’s original ‘Tuxedo Frame’ and personalized with the captions of your choice. All in a great storage tin with the completed image on top.